“Excito! Excito!”: A Veritable Feast is a collaborative artwork by Kenneth Tin-Kin Hung, Jessie Horning, and Sanh Brian Tran that creates, documents, and serves food dishes that represent and examine the past, present and foreseeable future of American food creation, production, manufacturing, and consumption. Excito! Excito! : A Veritable Feast has a photography component to the artwork. 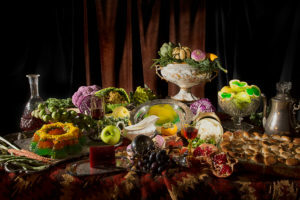 The still life photographs in the “Vanitas Flair” series of this artwork envision the style of 16th century Dutch Golden Age still life paintings to further emphasize the contrast between natural “whole” foods and artificially flavored foods as demonstrated in the Past, Present, and Future dishes. For additional information and still life photographs, please visit the website for the artwork, Excito! Excito!